Ted Cruz and Marco Rubio love Ronald Reagan. Would Reagan love them? 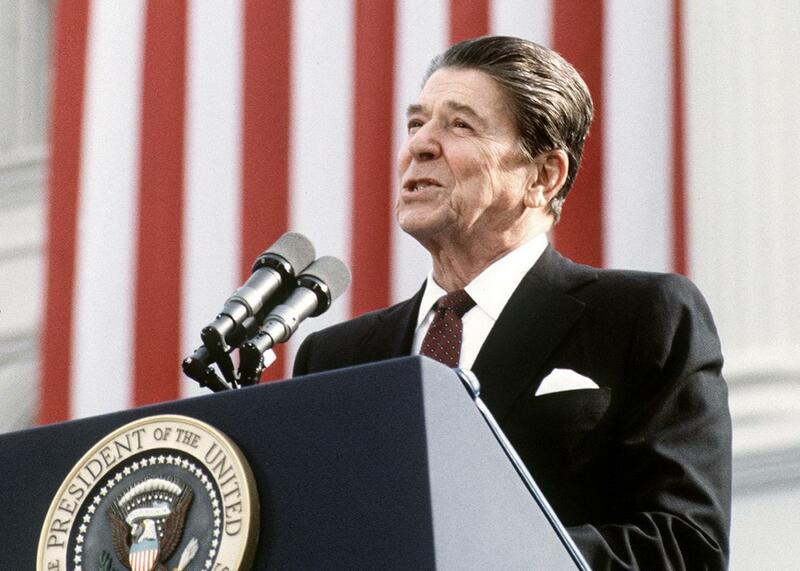 U.S. Ronald Reagan addresses supporters in November 1984. No one gets name-checked in Republican debates quite as often as the 40th president. At Saturday night’s debate in South Carolina, Reagan got 15 mentions; God and the Lord got a total of five. Asked what advice he would seek from a former president, Marco Rubio said, “I wish Ronald Reagan was still around. This country needs someone just like that. And if our next president is even half the president Ronald Reagan was, America is going to be greater than it’s ever been.” GOP candidates are especially likely to associate themselves with the Gipper when their conservative bona fides are called into question. We saw this tonight when John Kasich defended his support for Medicaid reform by noting that Reagan had also expanded Medicaid. Donald Trump cited Reagan’s early liberalism to defend his own past dalliances with Democrats. Things get a little awkward, however, when it comes to the subject of illegal immigration and “amnesty.” The 1986 Simpson-Mazzoli Act, signed into law by Reagan, granted amnesty to 3 million people who had entered the country illegally before 1982. (The word amnesty was specifically used at the time.) The law, which Reagan promised would “humanely regain control of our borders,” is widely regarded by Republicans as a model of what not to do to address the problem of undocumented immigration, as it failed to deter millions more people from entering the country. Rubio, who cites Reagan’s presidency as the reason he became a Republican, brought up the law at tonight’s debate. Yet all of a sudden the Florida senator wasn’t so eager to invoke Reagan’s name: “You go back to 1986 when they legalized 3 million people and promised to secure the border. It didn’t happen. And as a result, people have lost trust in the federal government.” They? Even more strikingly, Ted Cruz attempted to don the mantle of Reagan … while accusing Rubio of supporting amnesty, which, again, Reagan supported. “I stood with Jeff Sessions and Steve King and the American people and led the fight to defeat that amnesty plan,” he said. “That moment is what Reagan would call a time for choosing.” Perhaps, but it wasn’t a choice Reagan himself is likely to have made. The candidates for the Republican nomination often speculate about what Reagan would think if he were alive today. If he’d been watching this debate, he’d have been duly flattered by all the attention—and more than a bit confused.